The astounding neolithic (= "newer stone age") structures found since 1995 by the German archaeologist Klaus Schmidt, in what is now named Göbekli Tepe (Turkish for "Potbelly Hill") in Turkey, produced major headlines all over the world. What Göbekli Tepe proved beyond doubt was that neolithic people, supposed to be rather primitive and not highly organized, had not only built "wattle-and-daub" huts like in Hallan Çemi but large and complex "temples", "sanctuaries", or whatever one wants to call it, as early as the 10th millennium BC, or about 12 000 years ago. The 12 000 year old structures belonged to the Pre-Pottery Neolithic A (PPNA) period; they are more elaborate then the following PPNB structures. Around (8000 - 7500) BC, Göbekli Tepe was abandoned - after everything had been covered carefully with soil. Those ancient guys, for reasons unknown, did not want to leave any traces, it seems. While these people carved stone with amazing skills, they did not do it with metal implements, at least none were found. No pottery was found either, and that's why cultures like the one around Göbekli Tepe are also called "Pre-Pottery Neolithic A" (PPNA). For the meaning of the "A" refer to this link. It is surmised that these folks were hunters and gatherers, not really settled down, who just built and used all these temples - there are many - for some rituals or whatever. The remains of one of the actual "temples". The inset shows the carving on the central stone. Envisioning how the temple was built. It may or may not have had a roof. Some large-scale pictures can be accessed via this link. There are several of those round "temples" - and only a tiny part of the whole complex has been unearthed so far! The bigger pillars weigh up to 20 tons, and several 100 persons were required to move and erect those huge stones. They were quarried nearby but that is not essential. Moving heavy things just a few meters takes the same amount of people and organization then moving them larger distances like the several 100 m required in Göbekli Tepe. It just takes more time. Compare that to Stonehenge: built about 7 000 years later. Most stones there are of similar size; just some of them are much larger. Distances covered, however, were far greater. The Egyptian pyramids also came roughly 7 000 years later! and thus possibly even making and drinking beer. 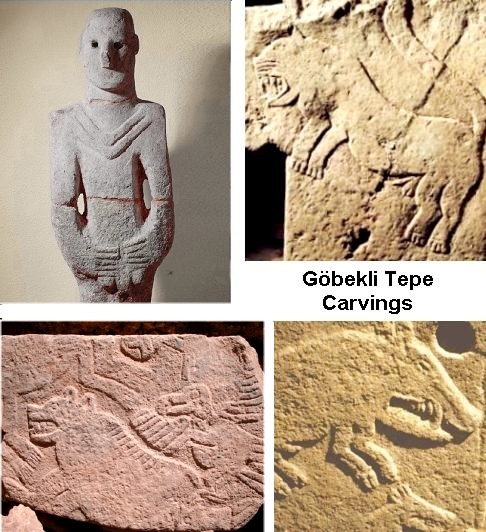 Göbekli Tepe does not predate "art" and music, however, as we know from this link. There are many ways to recover old temperatures rather accurately, and what we see in the data above for Greenland is typical for about everywhere. 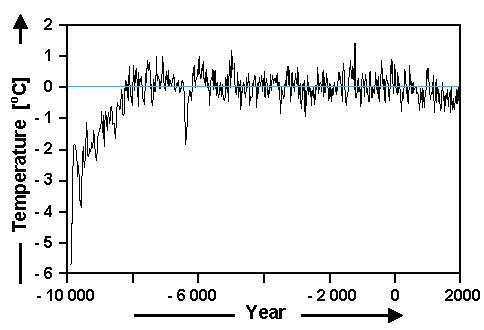 While it still did not get exactly cozy in Greenland, large parts of Europe, the middle East, and so on, became inhabitable and could support far larger populations than in the cold days before. I guess that the women finally got fed up about that care-free perambulating of their spouses, who enjoyed their mammoth spare ribs and playing hide-and-seek with the sable tooth tiger, but always forgot to take the garbage out of the cave. They demanded a nice home, with some shopping near-by and central places for social activities like gossiping. The men grudgingly consented for the usual reasons but soon discovered that the otherwise boring sedentary life came with a huge benefit: it allowed beer brewing on a large scale (not really kidding!). 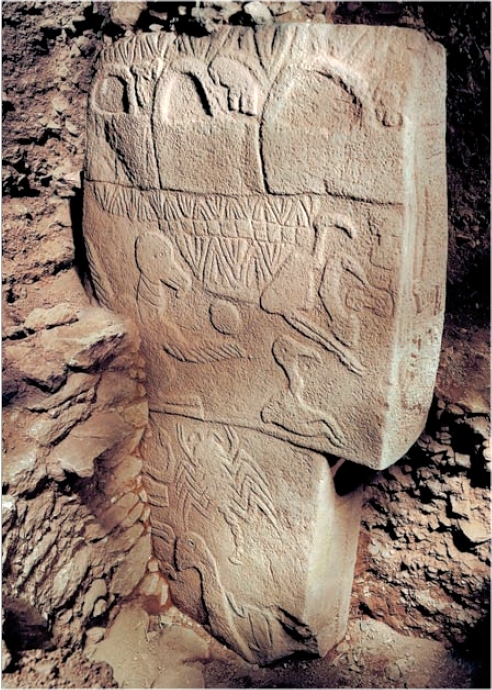 Statue (possibly "the oldest") and carvings on Göbekli Tepe pillars. 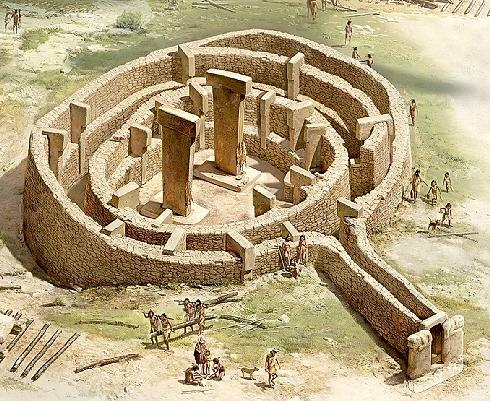 Source: Internet at large and Source: Klaus Schmidt: "Göbekli Tepe  the Stone Age Sanctuaries. New results of ongoing excavations with a special focus on sculptures and high reliefs", Documenta Praehistorica XXXVII (2010), p.239. With kind permission. All stone work was done with other stones - in particular flintstone tools, remains of which have been found. 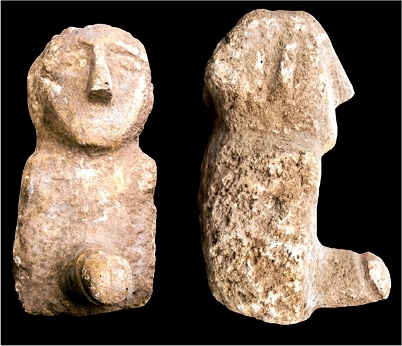 The limestone statue on the upper left is usually connected to Göbekli Tepe, but was actually found at Urfa, close by. It dates to the Early Neolithic. What the guy seems to be doing is a time-honored occupation of the male of the species. Well - that about covers Göbekli Tepe. Not much else has been found besides the stone structure. no traces of domesticated plants or animals, for example, and very little evidence for residential use. We will have to wait for what will come to light in the future. 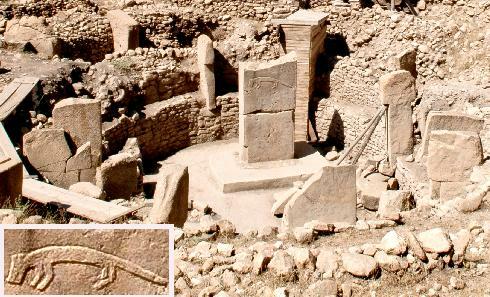 Göbekli Tepe and other places will allow good digging for many years to come. Even more exciting will be what will be found in places hitherto completely unknown but "there" for sure. Here is a relatively new find: an ithyphallic protome! Source: J. Peters, K. Schmidt: Animals in the symbolic world of Pre-Pottery Neolithic Göbekli Tepe, south-eastern Turkey: a preliminary assessment. ANTHROPOZOOLOGICA  2004  39 (1) With friendly permission.